Ever seen what a beast Google Chrome has become? I started monitoring that it easily took 2-3GB of my main memory sometimes and was really bogging my system down. Running Android Studio or Pycharm need quite some memory too and things got actually killed by the system once in a while, making me yet again re-consider Firefox. Firefox never had this issues as it only loads opened tabs, when you re-visited them. You might think having 30-50 tabs open in one browser session is a sign of miss organization, but I like to think it has to do with the fact that I always work on several projects (teaching and 1-2 research projects and recently also blogging again) all opened in different windows. So isn't there a way to keep all these tabs open without consuming 100-200MB each? 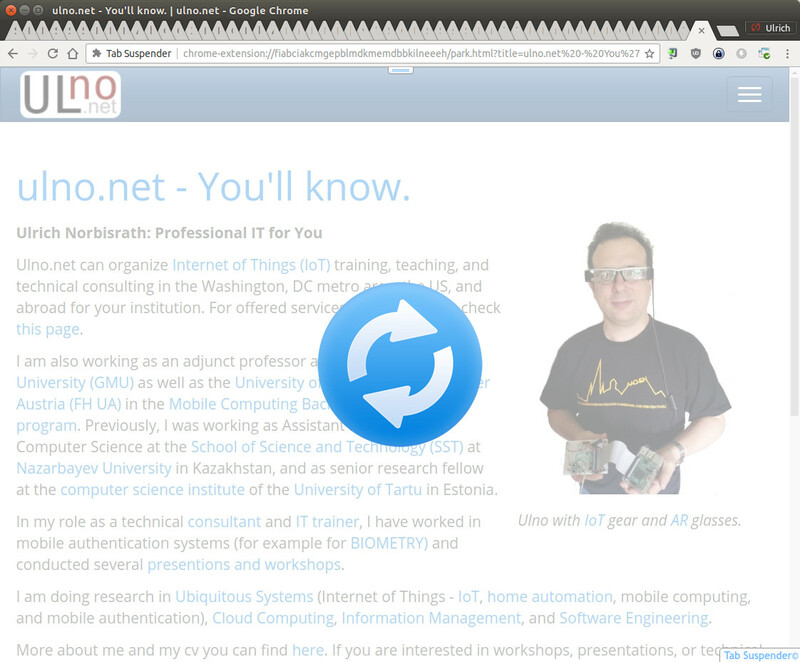 Yes there is, check out the Chrome extension Tab Suspender. And, yes it does the trick, It still consume 200MB for 40 tabs, but that's much better than Gigabyets. The difference browsing with more than 10 tabs is striking. After a while of inactivity in a tab it replaces it with its own link and grayed-out image (see supplied screenshot), you need to click it once to wake it up, should you visit the page again. Everything is stopped on the page and the memory consumption considerably reduced. If you Google for Tab Suspender, the first hit is actually The Great Suspender. I haven't actually tried it as the last update listed on the Chrome Webstore is from 2015. However The Great Suspender actually is open source and here is its github page. It also has many more ratings than Tab Suspender. Github shows recently filed issues, but no activity on the project since November 2016. So, if you use Tab Suspender, please share your impressions down in the comments.